Crunch is an online accountancy firm, in addition to their own accountants they have a large development team which works on a custom java app, this is what clients use to manage their accounts. Crunch gets a lot of feature requests from clients but with a team thats allways trying to hire more people these requests can take some time to implement. 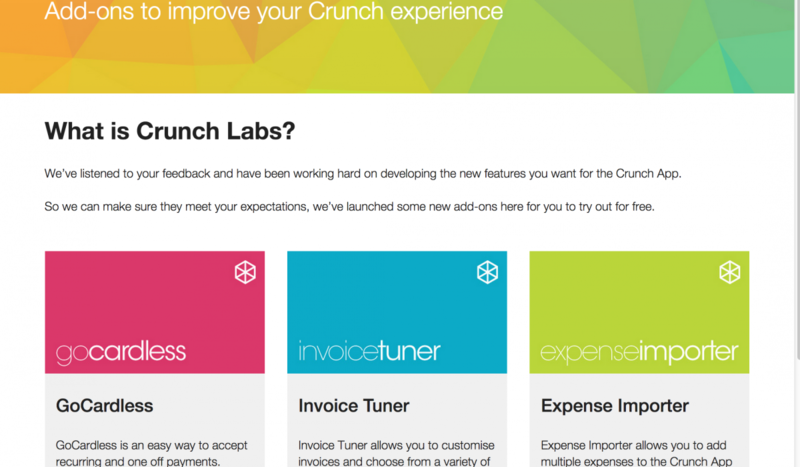 Crunch Labs was devised as a way to solve this problem as well as gauging the popularity of a feature before investing a lot of internal resources to implementing it. The Labs system is a server running the Laravel php framework, the new product ideas are then quickly built on this system and integrate with the app using the existing api. This approach allows me to build and release new features a lot quicker than an internal team could, this also means risks can be taken with unproven ideas. If an idea is shown to be very popular it can be added to Crunch's development roadmap and eventually removed from the labs system once a first party system is running. Crunch Labs talks to the app in the same way any other third party app would, it doesn't have any special access and makes use of the existing api. A full Eloquent inspired sdk was written for the API which speeds up the integration process.